Kerry Vinson (B.A. PSYCH) founded Animal Behaviour Consultants in 1998, and since then has assessed and treated more than two thousand dogs for behaviour issues ranging from separation anxiety to all types of aggression. Since being designated as an Expert Witness in the area of canine behaviour (aggression and re-training) he has also assessed dogs involved in court cases for the City of Ottawa, the City of Toronto, the Government of Ontario and numerous private clients facing Dog Owner’s Liability Act issues, beginning with his testimony at the Trempe Inquest (an official provincial inquest conducted by the Ontario Coroner’s Office in 1999). His court testimonies have spanned the period from 1999 to the present, including on behalf of the Durham Region Crown Attorney's Office in the case of Regina v. Wright. The dog behaviour assessments provided by Kerry to the courts involving D.O.L.A. charges have been recognized as accurate in 100 percent of such cases. Kerry has also conducted multiple seminars on dog behaviour problems at Colleges and other venues throughout Southern Ontario. 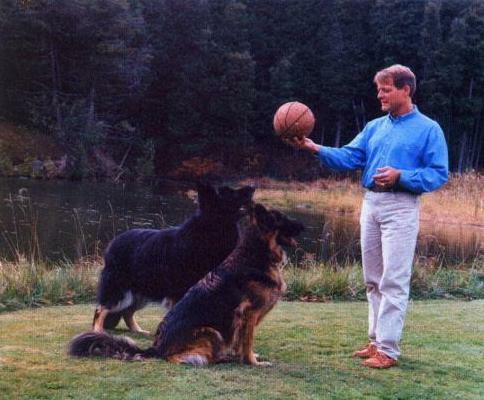 In addition, he has presented lectures for the Toronto Academy of Veterinary Medicine Hospital Personnel Series in 2001, 2004 and 2008, and at the Ontario Veterinary Medical Association Annual Convention in 2006. The Behaviour Modification Programs that Kerry provides for clients and their dogs are composed of non-confrontational, positive-reinforcement-based principles supported by the science behind Learning Theory. They focus on the concept of good leadership, as opposed to the idea of ”dominance” espoused by the training ideas popular in the latter half of the last century. Kerry does not utilize physical punishment for aggressive dogs, as science-based research has shown that this can actually increase their aggression in the long run. As well, punishment can make fearful dogs even more fearful and may exacerbate their behaviour problems. The goal of Animal Behaviour Consultants is to provide accurate, objective assessments of canine behaviour and to salvage the lives of as many dogs as possible, since reliable sources like Dr. Nicholas Dodman of the Tufts University Animal Behaviour Clinic in Massachusetts estimate that half of all dogs are euthanized before they reach the age of two due to their behaviour. Kerry has made it his personal goal to reduce this appalling figure in the province of Ontario. His services are available throughout the Greater Toronto Area and most of southern Ontario. Contact him for more information at (705) 295-3920, (905) 352-3353, or toll free in Ontario at (800) 754-3920.